It's Friday again!!! Yippeee!! A couple weeks ago, I had so much fun linking up with Dana to do a combination Finish the Sentence Friday and Ask Away Friday post, that I decided to do it again today!! Today I am partnering with Rabia from the Liebers. Here are the my answers to the questions. To see my questions for her and how she answered them, head on over to her blog! The first thing that comes to mind is this story that I shared on my blog back in May 2012. Basically, my youngest (who is now 6) is absolutely terrified of bugs. We were driving somewhere and she started screaming. I honestly thought she was in some kind of terrible pain. My heart was racing as I tried to drive safely and find a place to pull off the road. When I finally did, I jumped out of my minivan, opened her door, and she pointed to the tiniest spider I have ever seen crawling on the roof above her. At the time, it wasn't that funny, but I laugh every time I think about it now. 2. 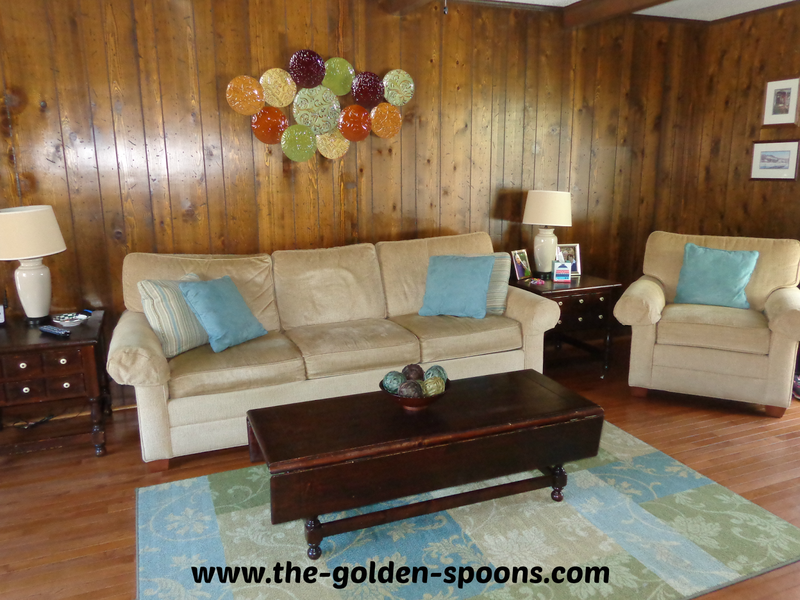 What is your favorite room in the house and why? 3. Would you rather have a rewind button for your life or a pause button? 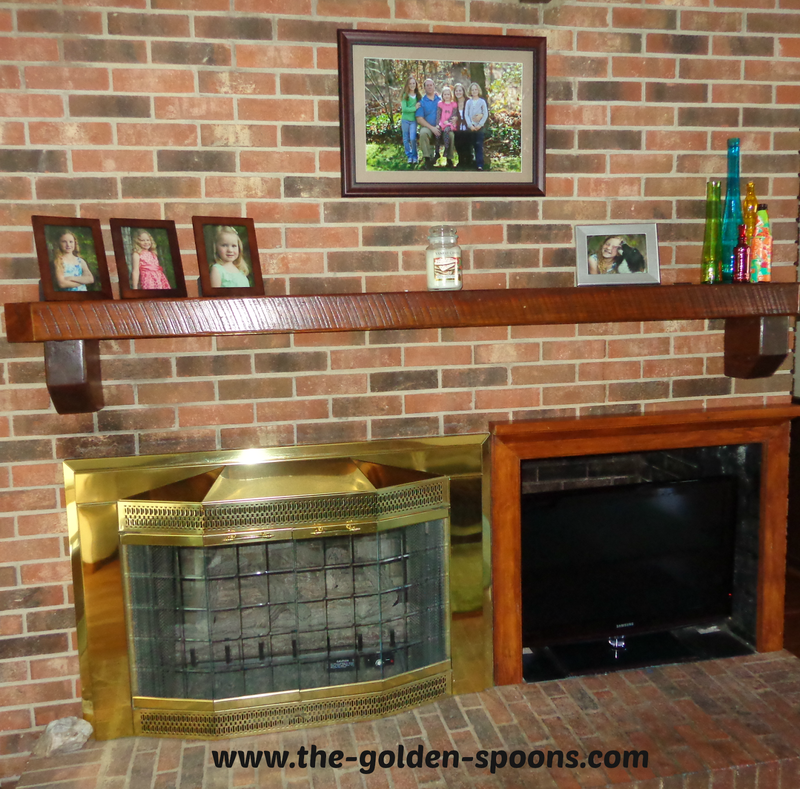 One reason I started this blog was to record memories for my daughters and I am very nostalgic. However, I don't think I would want to hit rewind and go back in time. What if going back changed things?? I could definitely use a pause button sometimes just to take a breather from a crazy day or to savor a special moment for just a little longer. 4. What is the funniest thing one of your girls has said or done this week? One night, my youngest asked me if she could have a teaspoon of salt and then take a bath. When I asked why on earth she needed a teaspoon of salt, she was very coy. "I'm just doing something," she said. After asking many questions and practically prying information out of her, it turned out she had watched a video on her Kindle that supposedly demonstrated how to make yourself a mermaid. She was very disappointed when it didn't work. She thought she had done it wrong and wanted to try again. I had to explain that there was no way to turn yourself into a mermaid and that they did it in the video using special photography tricks. Eventually, she was placated, but still declared, "Mermaids ARE real!" I need to add that to the list of "Conversations You Never Dreamed You Would Have." 5. How does your oldest being a vegetarian affect the way to prepare meals? She decided when she was 7 to become a vegetarian. I'm not going to lie - when she first started, it was really tough. My hubby is a "meat and potatoes" kind of guy and my youngest is SUPER picky. Trying to come up with meals that will please everyone is really, really frustrating. I have learned some tricks that make incorporating her vegetarianism easier, though. For example, there are actually some pretty good meat substitutes out there. If I make chicken for the rest of us, I can heat her up some "vegetarian chicken" to go with her meal. If I am making pasta, I just keep some sauce separate for her without the meat. With practice, it has gotten easier and I honestly admire her for her dedication to something she really believes in. 6. What is your most comfortable sleeping position? I always fall asleep lying on my right side, but when I wake up, I am always on my back! 7. Tell us about the most recent book you’ve read or movie you’ve watched. I am currently reading "7" by Jen Hatmaker with a Bible study group form my church. Jen and her husband started a church in Texas and, in this book, she is "experimenting" with cutting back on the excess in her life in hopes that it will open up more space for God and spirituality. Each month for 7 months she focuses on one area of her life. For example, the first month she focuses on food and allows herself to only eat 7 foods for the entire month. She can eat as much as she wants but only those 7 things. She also tackles media, clothing, spending, and stress. It is very eye-opening and really makes you think about the thing in your own life that are truly necessary! 8. What’s the oldest post in your “draft” folder and why haven’t you finished it? I had to look this one up! The oldest draft I have was started on August 21, 2011. It is titled "The Blankie Situation: An Update." It was supposed to be a follow up to this post about my youngest daughter's attachment to her blankie. I had intended to spend that summer trying to decrease her dependence on her blankie. I had promised my readers an update at the end of the summer. I never wrote it because there was nothing to update. My attempt to squelch her habit failed miserably. In the past 2+ years, however, I am pleased to report that we have made improvement! This is mostly due to the fact that she is not allowed to take it to school and, since she is in first grade, has been spending weekdays blankie-free for the past two years. She is still very attached to it at home, though. 9. If you could go 100 years into the past or 100 years into the future, which would you pick and why? I would pick the future. As I said about the rewind button, I wouldn't want going back to the past to change my present. I would love to go into the future, though, to see what my girls are like as adults. What careers did they choose, did they marry, did they have children??? If I went forward 100 years, I could meet my great-great grandchildren. I am also curious what the state of the country would be by then. Technology would be amazing then, I'm sure, as well. They would probably think my iPhone was obsolete and they would probably equate Twitter to something ancient - like we think of hieroglyphics! 10. Do you have a favorite charity or non-profit that you support? Most of the charity we do as a family, whether it is monetary or giving our time, we do through our church. Having taught special needs children, many of whom were from very low socioeconomic conditions, I always have a soft spot in my heart for children's charities - particularly ones that help abused children or underprivileged kids. Also, before we had our own children, we and a foster child. There is a local news station that collects toys every Christmas for foster children in the county. We received some toys from them for our foster child, so we always make a point to donate toys ourselves every year. **Ask Away Friday is hosted by The Real Housewife of Caroline County and The Bold Fab Mom. 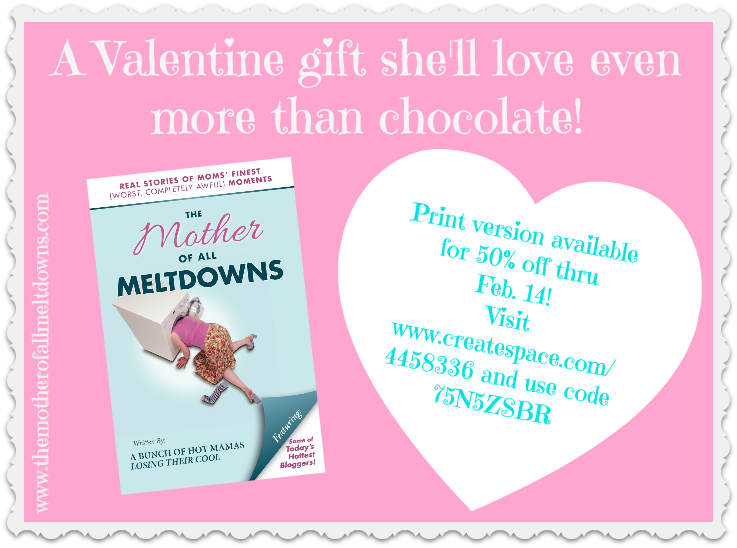 Since Rabia and I are both contributing authors to the Mother of All Meltdowns, I also wanted to share with you that the book is currently on sale!!! You can get the print version for 50% off thru Valentine's Day by visiting our Createspace (see below) and using password: moam123. The Kindle version is also available thru Amazon for only$.99!! !